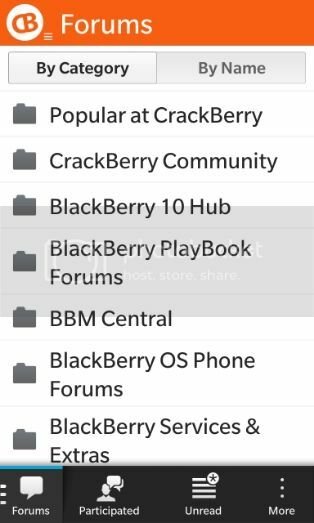 So you wanna keep an eye on CrackBerry but are away from your desktop. No problem if you have the CB10 app. With the app you can read the blog, post in the forums, upload pictures, get help, shop, and feed your gaming addiction. The CB10 app is currently (we hope) undergoing some changes so some of this info will have to change when that app arrives. For now, download the app from HERE. 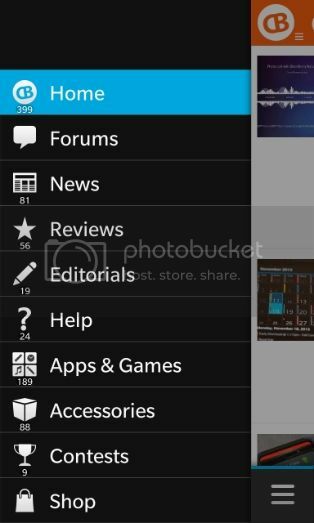 DISCLAIMER: This app works with the Z10, Q10 and Q5. It may not be working well with the Z30, or with certain 10.2 and 10.2.1 leaks as of right now. 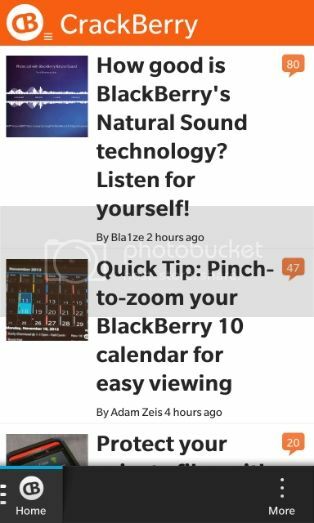 We will be updating this post with the Z30 information as soon as the app is updated. Stay tuned!!! As you can see, I have about 399 different stories from the blog that I can read! Hmmmm, I've been a little lax there. Well my favorite part of the site is yet to come, so hold on. If you continue tapping on menu items, you can go to the Editorials, the News, Reviews, Help, Apps, and even the Store....all from this one menu! Of course, I change the Home choice to Forums. Close the app and open again. Voila! It opens to the Forums! 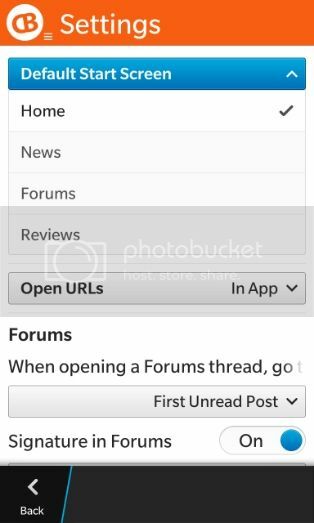 So at this point you can drill down these By Categories or choose ByName, where you can choose from an alphabetical list of all the forums.At the bottom of the screen is a very useful button to tap: Participated. So there's one more screen I can show you. When you are in a thread and hit the overflow buttons (the three dots on top of one another) it actually says MORE int he app, you see this menu. From here you can navigate to the previous page of the thread, reply from here, unsubscribe if you are subscribed already (as I am, hence why UNSUBSCRIBED appears), and do a number of other things. You can open a link in the browser, or copy the url for pasting in another browser or email. I like the REFRESH menu item at the bottom since I can stay in the thread and hit REFRESH and find the latest posts. 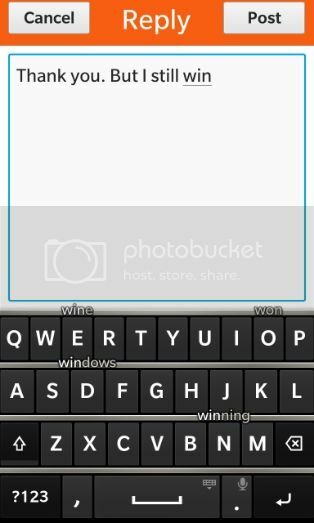 Next you will see a screen like this with the keyboard up (it thinks you want to type!) 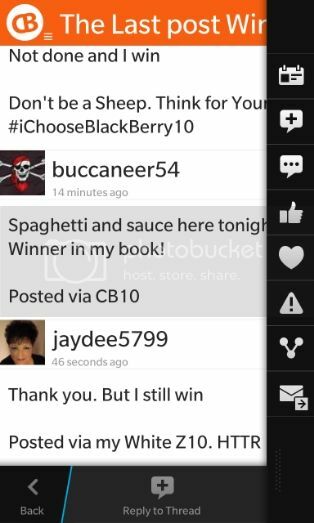 But hit the word REPLY at the top as shown. Once you do that, the keyboard drops out of sight and you are able to see ATTACH and a paperclip. This is where you need to tap next. 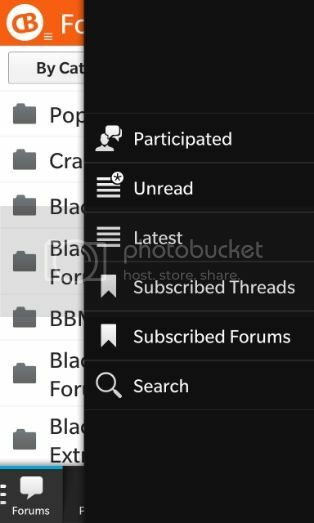 Next step is to navigate to a picture or screen shot from your file manager. You can navigate through your pictures till you tap one. 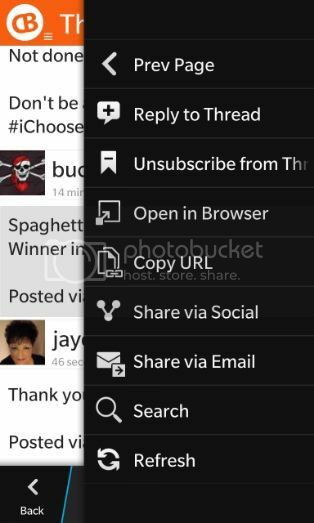 When you do, your phone jumps to this screen and you will see the underlined words. This is the picture being attached. Once that's done, just tap POST up in the corner. So there you have it, the CB10 app as it stands right now. We believe another version is on the stove and as soon as it is ready to be sevred, we will update this thread to show those changes!!! Last edited by jaydee5799; 11-13-13 at 01:02 PM. diegonei, FF22, middbrew and 5 others like this. Great guide! Will be a big help to many!